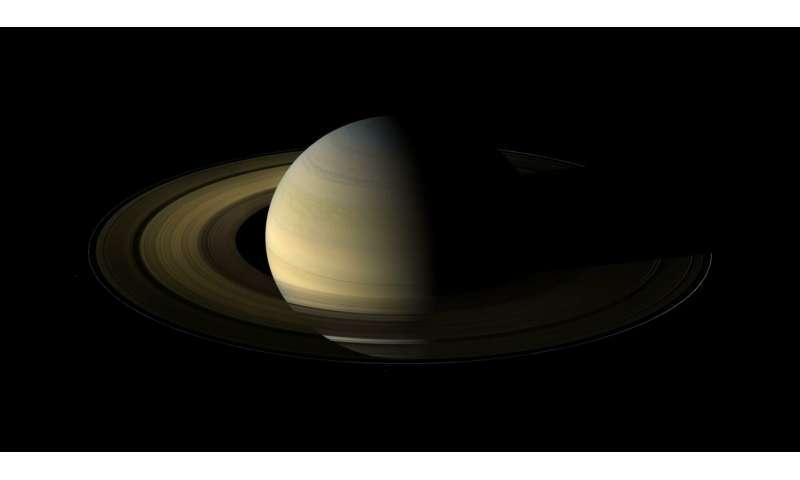 When Saturn's equinox is viewed from Earth, the rings are seen edge-on and appear as a thin line – sometimes giving the illusion they've disappeared. In this image however, Cassini had a vantage point of 20 degrees above the ring plane, and viewed the planet from a distance of 847,000 kilometres. Its wide angle camera took 75 exposures over eight hours, which were then aligned and combined to create this mosaic. The rings also appear darker than usual. This can cause out-of-plane structures to look brighter than normal and then cast shadows across the rings. These Saturnian shadow puppets only appear a few months before and after the equinox. The shadows that Cassini saw revealed new 'mountains' in the rings, and also discovered previously hidden moonlets. Radial markings known as spokes are also visible on the B ring on the right side of the image. Cassini explored the Saturn system for 13 years. It is a cooperative project of NASA, ESA and Italy's ASI space agency. This image was first published in September 2009; read the full caption for more information and imaging details.